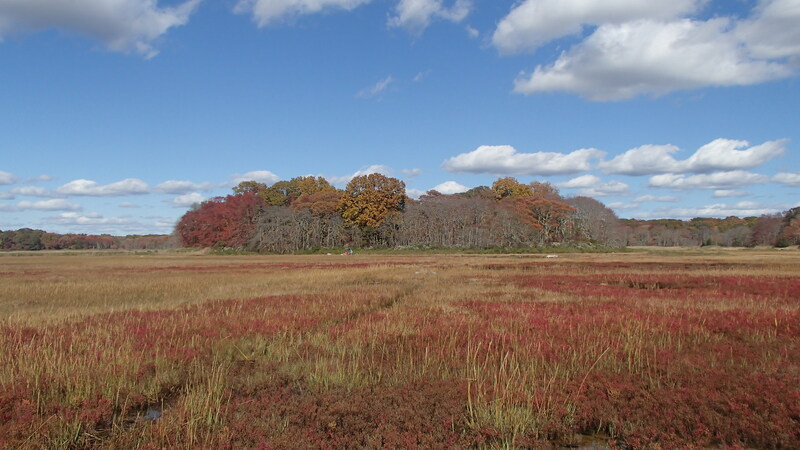 Barn Island Marsh (CT) in October. In a recent publication in The Auk (found here), Alyssa Borowske, Chris Elphick, and Carina Gjerdrum looked at the effect that reproductive investment has on the timing of three events in the lives of male and female Saltmarsh and Seaside Sparrows: returning to the breeding grounds in the spring, molting into new feathers at the end of the breeding season, and departing the breeding grounds in the fall. 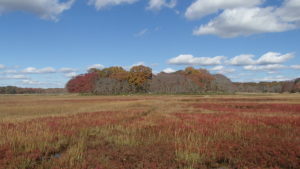 Barn Island Marsh in April. For birds that migrate away from the place where they reproduce and spend the winter someplace warmer, migrating back in the spring is an important event. If individuals are territorial, arriving earlier than competitors means first pick of the best territories. Arriving early can also maximize opportunities for finding and competing for mates. Arriving too early, however, can be costly: in early spring, food may be scarce and there may be a high risk of inclement weather. The date when an individual “should” arrive balances these benefits and costs. Because the pressures to arrive early are stronger for males, in many bird species, males return to the breeding grounds before females. Borowske et al. 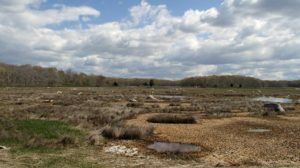 mist-netted sparrows throughout the breeding season, beginning shortly after the very first birds arrived in the Connecticut marshes. After analyzing the ratio of males and females of each species caught on given dates throughout the season, they found that Seaside Sparrows follow this standard arrival pattern, with males returning to the breeding grounds before females. This result is not surprising, because Seaside Sparrow males compete for both territories and females. 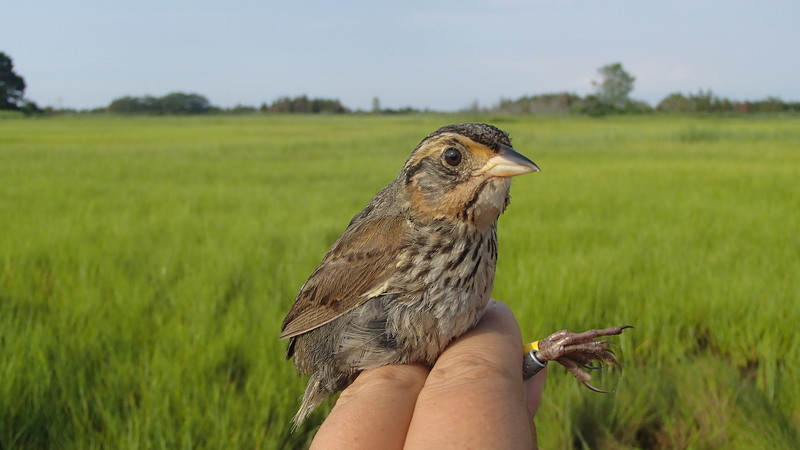 Interestingly, Saltmarsh Sparrow males also arrived in Connecticut before females. Saltmarsh Sparrows are completely non-territorial, so males have no reason to return early to claim a territory. 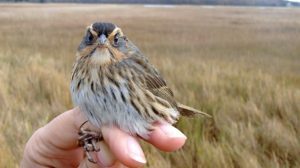 However, both male and female Saltmarsh Sparrows are completely promiscuous, with strong competition among males for mates, and this pressure may be enough to give males a reason to arrive early. At the end of the breeding season, many bird species drop and re-grow all of their feathers before migrating back to the non-breeding grounds. For Saltmarsh and Seaside Sparrows, this molt is particularly important, because the harsh salty, sunny, tidal marsh environment, coupled with all the activities the birds do during the breeding season, leads to feathers that are incredibly damaged by the end of the summer. Because growing new feathers takes energy and birds with missing or partially-grown feathers aren’t as quick or agile in flight, most birds don’t begin molting until after they are finished breeding. An individual that completes breeding early may also be able to begin molt early. But, because growing new feathers is so energetically expensive, if an individual ends the breeding season in poor condition, it might not be able to grow new feathers right away. Borowske et al. 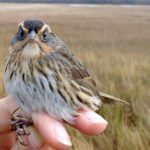 documented the molt status of sparrows caught in August through October and found that, in both Saltmarsh and Seaside Sparrows, females started molting slightly later than males of the same species, but the overall length of molt was slightly shorter. 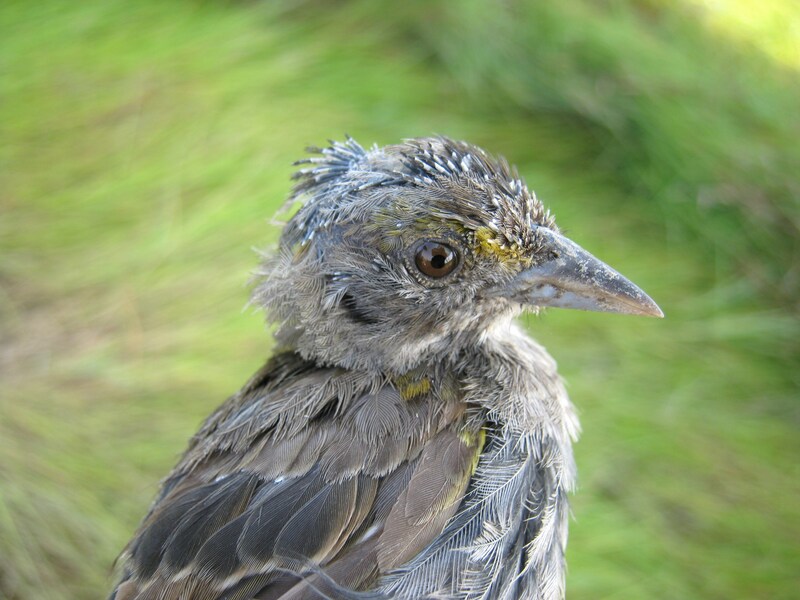 Molting quickly can be a way to catch up from starting molt late, but other studies have found that feathers grown quickly are often poorer quality than feathers that are grown more slowly. Because a bird cannot repair a feather once it breaks, feather quality can affect its ability to fly and keep itself warm and dry—until, months later, the bird grows a new set of feathers. 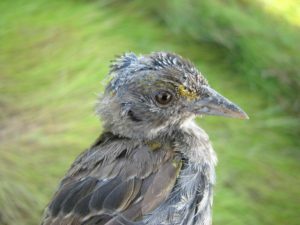 Molting slowly might produce the best feathers, but delaying departure from the breeding grounds can lead to running out of food and increase the risk of encountering bad weather. As with when to arrive to the breeding grounds, when to depart is a balance between the costs of staying too late and the benefits of waiting until all feathers are grown and the individual has good enough muscle condition and fat storage to survive the long flight. Through continuing to mist-net sparrows until late October, Borowske et al. 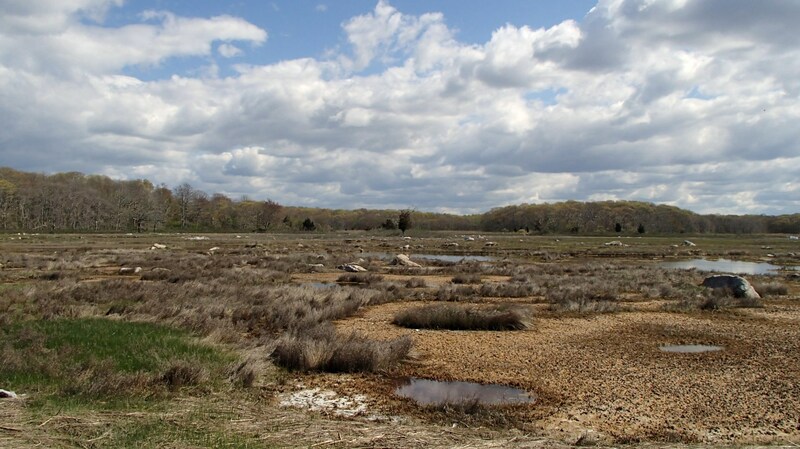 found that in both Saltmarsh and Seaside Sparrows, males departed the breeding grounds earlier than females. Looking at the patterns of molt and migration timing together suggests that females of both species pay costs of their reproductive effort that males don’t. This carrying-over of costs (or benefits) from one season—in t his case, reproductive effort during the breeding season—into the next—in this case, post-breeding molt and migration—isn’t uncommon. For all individuals, the annual cycle is interconnected and what happens to a bird in one season will influence its performance and opportunities in subsequent seasons. 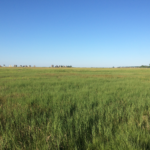 As a researcher, keeping the full annual cycle in mind is important for fully understanding the ecology of a species.